It will come as no surprise to you that not all lists are equal. Quality, accuracy, availability, price and so many other factors can vary hugely across different sources. 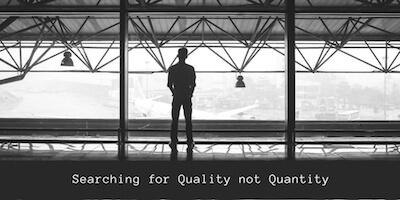 Poor quality data will cost you more than just dollars! From the way the data is sourced, to how it is processed and maintained, these and so many other factors influence the quality of a list and therefore it’s performance. Things are constantly changing - people and businesses move, email addresses can change and recipient habits can change too. A high quality resource will be on top of these changes and this will be reflected in their data performance. This is what really matters - whether you’re buying 1,000 contacts or 1,000,000 if the list doesn’t produce any customers it is just a cost. Return on investment (ROI) should be at the forefront of any and every campaign. If you buy or rent poor quality data, you are taking a big risk. You could strike lucky and achieve a response, but more often than not, poor data leads to poor results. Companies large and small care about their reputation, and so they should. With more and more people relying on reviews as part of their buying process, having a great reputation matters. If your data causes you to send irrelevant, unwanted information to recipients’ chances are they will let you, and their network, know - this situation can be exacerbated if your campaign is set up for repeat sends. Blacklisted on email lists - this is quite extreme and a reason to be cautious if your data provider sends you the raw data to use. Typically, a data provider will distribute your message - so on a technical level the message is sent from the vendor - it is therefore their sending server that will be blacklisted or added to spam filters. Leaving this responsibility with the vendor is a good choice as they will be more motivated to keep clean, relevant lists. Worst case scenario, data can be stolen or acquired in illegal ways, sold on for a quick profit and then the vendor disappears. The result is recipients being bombarded by marketing messages which could land the sender in hot water. So, beware of too-good-to-be-true offers. This is a major concern for anyone renting data. You could find a list with the perfect selections for your target audience, but if it’s overused the performance will be poor - guaranteed. It’s commonsense, if someone receives countless marketing messages in their inbox from the same source chances are the messages will be sent to junk or worse, the sender will be blacklisted. For reputable data vendors the quality and ultimate performance of their list dictates their future earning potential. It’s in their interests to maintain a good balance between profiting from the data and ensuring it will earn a return over a long period. Don’t be put off by a vendor offering limited email availability - this is a good thing; it shows they are maintaining their list really well. The list has been used appropriately - so all the address fields have been printed correctly on the envelope, minimizing the risk of failed delivery. For email this is a little harder - we typically don’t have direct access to the data and therefore we cannot seed it. What we can do is check through analytics how many ‘hits’ an element has had. For example, if the top banner of your email is an image, this will sit on your server, every time the email is opened your server receives a request for that image, counting the number of requests will give you an indication of how many emails have been opened. Check with your vendor that they don’t host your images on their own server - seeing zero hits can be alarming but it could just be the set-up of the vendors email software. Beyond the expense of preparing creative, printing and postage there are some significant costs to getting email and postal data rental wrong. Reputation, time, loss of earning from unfulfilled sales targets are just the tip of the iceberg. If you would like help finding high quality, high performing lists call, Donna Peterson, today. I can be reached at +1 860-210-8088 or email her directly dpeterson@worldinnovators.com. Founded in 1980, World Innovators has been a pioneer in B2B Marketing Worldwide.